Spring cages can improve the operating life of your die springs by providing a flat pocket for the operation of each spring. If a die spring fails and breaks into pieces during operation, a cage may contain the pieces and provide some protection against damaging other parts of your die or mold. 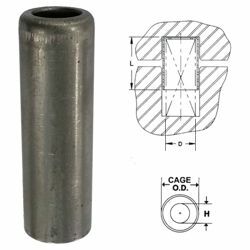 A cage can be installed around a die spring inside a bored pocket or over a guide rod. Danly spring cages are made of A513 tube steel and conform to NAAMS standards. They can be used to protect inch or metric die springs. There are 3 different part numbering systems for spring cages. See our spring cages cross reference for an explanation if the standard inch and metric sizes. The available major diameters (D) are 3/4 to 2 inches (20mm to 50mm). The available length (L) are 1 to 12 inches (25mm to 305mm). Please contact us if you need a different size, or if you need us to make any alterations. From Joe J of Niagara, Wisconsin on 6/29/2017 .